Pan Celtic Festival returns to Letterkenny from April 23 - 28. THE International Pan Celtic Festival returns to Letterkenny this month, bringing with it a colourful and vibrant celebration of the music, song, dance, pageantry, languages and sports from the six Celtic nations - Ireland, Scotland, Wales, Cornwall, the Isle of Man and Brittany. The festival runs from Tuesday to Sunday next, April 23rd to 28th and boasts a packed programme with some 300 international performers. In order to encourage as many people as possible to enjoy the event, the Pan Celtic Festival organisers are offering special €10 all day tickets which enable admission to all festival events in any one day. They are available now at An Grianán Theatre Box Office, Tel: 074 91 20779. 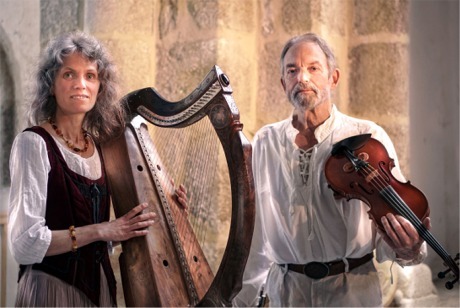 Traditional harp and violin duo, Violaine Mayor and Joel Herrou, will perform at the Breton Festival Club Night at the Mount Errigal Hotel on Wednesday, April 23rd, from 8pm. There will be much to look forward to over the five days and nights of the festival. Among the perennial festival favourites are the special Festival Club variety concerts, hosted by the individual visiting Celtic nation groups. The first of these, the Breton Night, takes place at the Mount Errigal Hotel on Wednesday, April 24 from 8pm. This will feature performances by the 30 strong pipes, bombards and drums band, Bagad Bleidi Kamorah, the 20 member Cercle de Vannes dance ensemble, the Hent Telenn Breizh singers quartet and the Kerdin en Avel traditional Breton band. The Breton groups are renowned for the beauty and the detail of their exquisite traditional costumes, as seen in the image below. 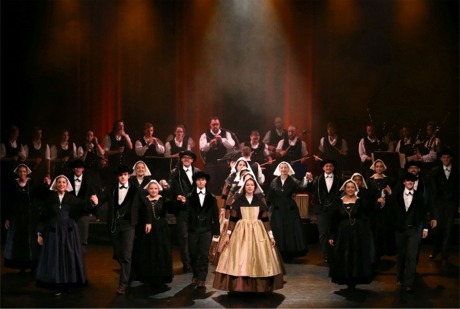 Breton traditional dance ensemble, Cercle de Vannes, will perform at the Breton Festival Club Night at the Mount Errigal Hotel, Letterkenny on Wednesday night, April 23rd, from 8pm. Three further visiting Celtic Nation Nights will take place at the Mount Errigal Hotel, over the course of the Festival. On Thursday, April 25th, it’s the turn of Cornwall and the Isle of Man. Friday, April 26th is Wales Night and is a must see for choral music lovers, while on Saturday, April 27th, it’s the turn of the Scots. Admission to each of the Celtic Nation Nights is €10 and tickets may be purchased in advance at the An Grianán Theatre box office or purchased at the door on the night. The festival will take to the streets on Friday afternoon, April 26th, with the Pan Celtic Parade at 2pm from An Grianán Theatre to the Courtyard Shopping Centre. The parade will feature marching bands, dancers and musicians from the six Celtic nations, as well as special appearances by Inishowen Carnival Group and the Carndonagh Brass Band. Details of the Pan Celtic Festival events are all to be found in the festival programme, which may be downloaded from the Pan Celtic Festival website at www.panceltic.ie .